The base polish is LA Colors – Candy Sprinkles. 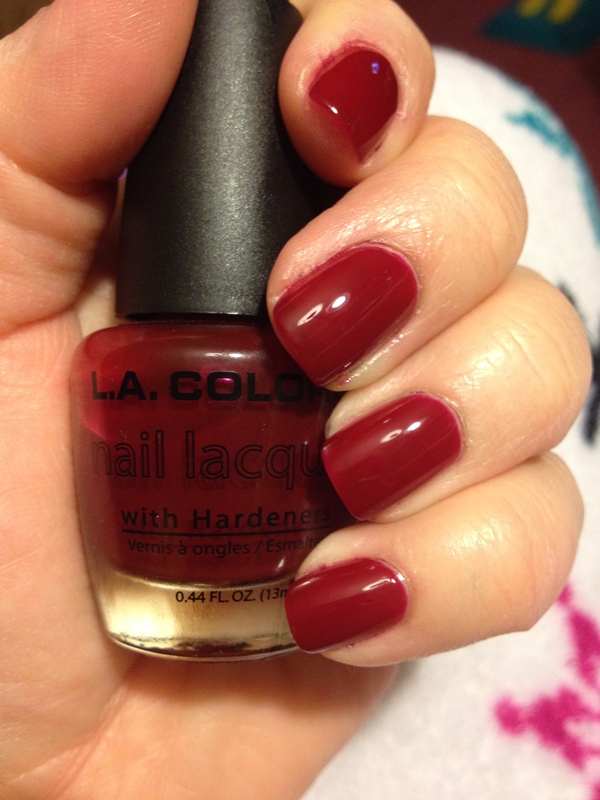 LA Colors polishes are generally about $1.50. I know they sell them at Dollar General and cheap places like that. My experience is that LA Colors polishes are kind of hit-or-miss, but since the price is right, I’m usually willing to take a gamble. This is definitely my favorite polish in the line, so far. I’m definitely going to be wearing this one again in the spring. The designs on my middle and ring finger are all done with craft paint. For both nails, I started by painting my design in white, and then when in with the colored paint, leaving a border of white showing. If I had just used a solid color of polish, I probably wouldn’t have done the white background/border thing, but since the base color was heavy on the glitter, I figured it would be a good idea. I think it helps the designs pop. 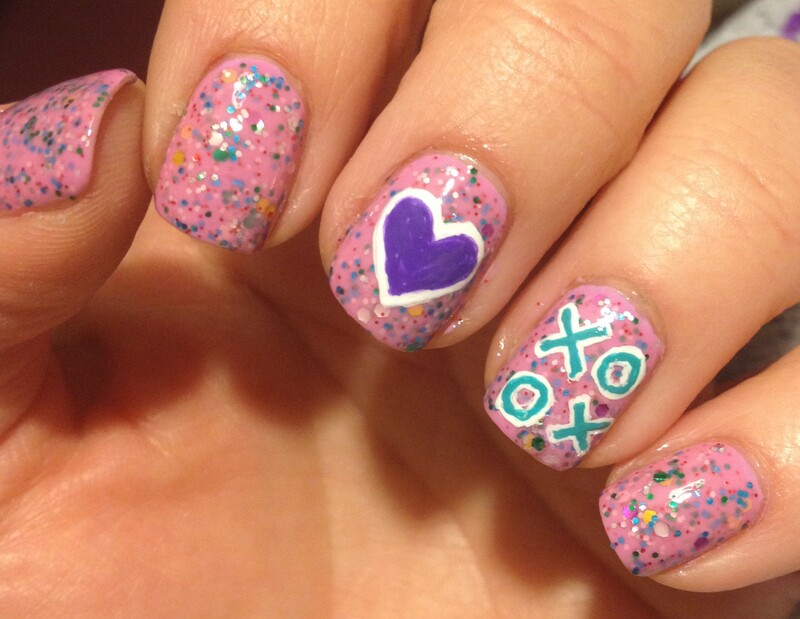 I have one more nail art design that I need to get posted here before tomorrow, so be on the lookout for that! I know Valentine’s Day can be a depressing day for some, but just know that God loves. You are loved more than you can know! Thanks for reading and have a great weekend! I’ve turned two more of my “untrieds” into “trieds”. I know, those aren’t even words. 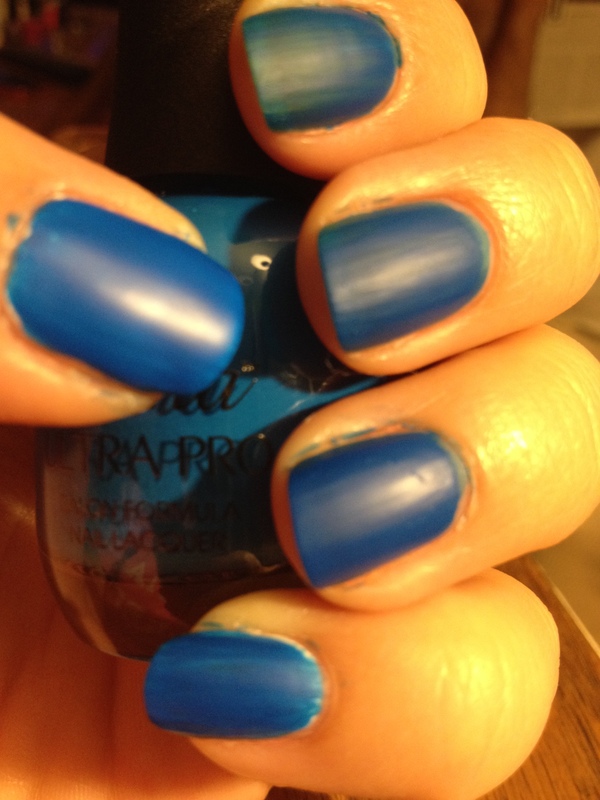 This polish is pretty sheer, so it took either 3 or 4 coats to get it opaque like this, but it’s so pretty! The color is just so rich! 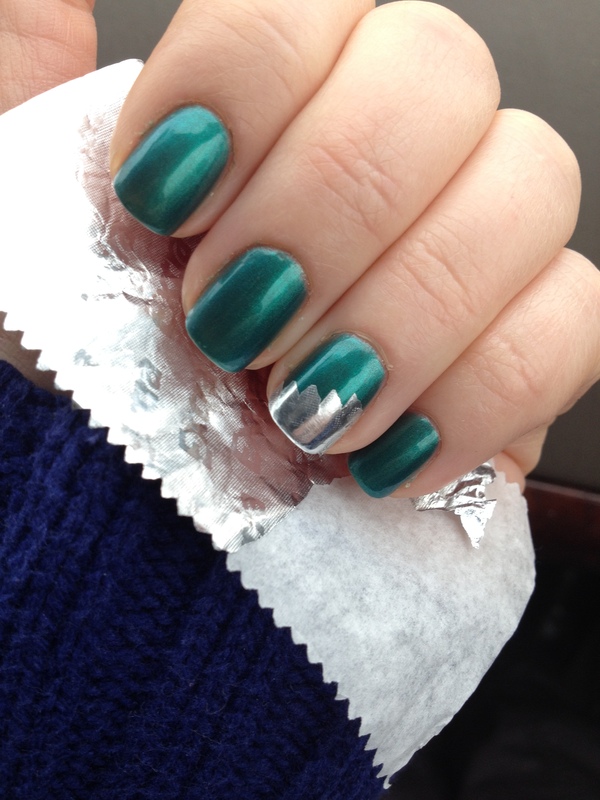 Sometimes I felt like my nails were an emerald-y Christmas green, and other times I felt they looked more turquoise. Such a good color for the cooler months! My hubby even liked it, and as a rule, he hates anything that has to do with peacocks. I’m sure you are all dying to know why my hubby, Mike hates peacocks, right? Okay, I’ll tell you. The first apartment we lived in after we were married was out in the country in redneck territory. One particular redneck owned a peacock that he just let roam around the country side. I don’t even know if that’s legal. Anyway, the peacock, who our little-old-lady-landlord called “George” liked to sit in the tree right outside our bedroom window. Well, every morning from April to August, George would sit in that tree at do his mating call, starting at about 4:00am. Here’s a youtube clip of what it sounds like. I’m a pretty sound sleeper, but Mike is not. He assaulted George with tennis balls, golf balls, rocks, a super soaker,…. George would just hop to a branch that was out of Mike’s reach. George would not be deterred. Anyway, we moved from that apartment after about 3 year when we bought our home. After we moved, we heard that George was hit by a car. We were not sad. Did you know that you can actually peel the foil off of the paper part of the wrapper? It takes a little bit of work, but then you are left with a really thin foil layer that has a little adhesive on the back. This is a jelly formula. This is four coats and you can still see my nail line a little bit, and the color is still not as rich as it is in the bottle. It is nice and shiny and I’ve actually gotten multiple compliments on this one. I think I’ll have to do some jelly sandwiching with this one in the future. The “hair” is a whole bunch of loops like a Cabbage Patch Kid! 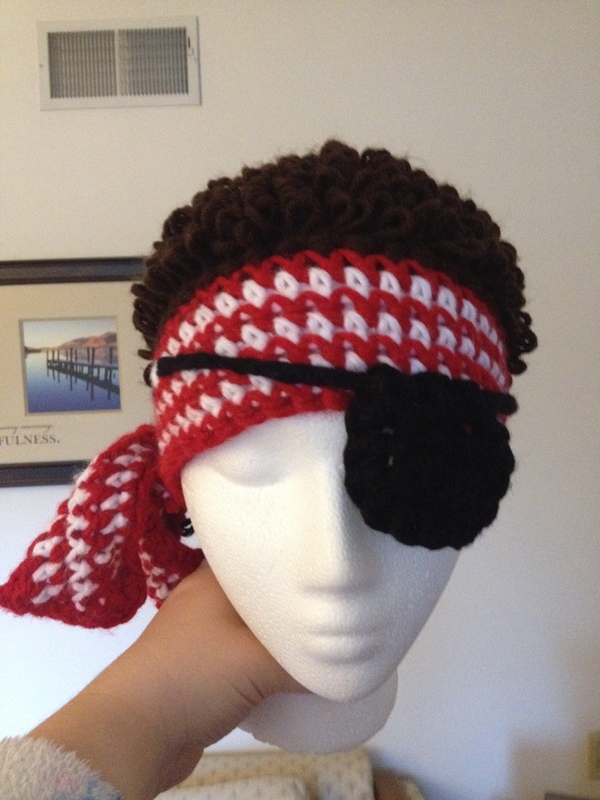 And the eye patch is removable/adjustable. I actually have a little etsy shop, but I don’t have any items listed for sale now since I’m offering them at craft fairs. I’ll let you know when I have some items back up for sale in my shop, just in case any of you are interested. So, here are my nails of the day… My NOTD, as they say. Whoa, I just learned how to add a boarder to my pictures. I’m pretty stoked about that. I was pretty happy to find this L.A. Colors Flash Pop in my local Dollar General / Family Dollar. I’ve never seen these sets anywhere else, so my guess is that they may be exclusive to those stores. It’s weird that there are polishes that are exclusive to Dollar General / Family Dollar, but there totally are. More about that at a later time. They thing that prompted me to buy this was the neon pink glitter. Outside of the indie polish scene, neon glitter is pretty darn hard to find. At $2.50, I couldn’t pass it up. The pink glitter is mixed with some shredded black and silver glitter along with some silver micro glitter and tiny silver bar glitter. The pink glitters are pretty thin transparent, so unfortunately, I don’t think they would show up well over a dark color, but I’ll have to test that out later to be sure. Since the glitters are thin, they do lay nice and flat on the nail. The clear base is a bit gunky, so you sort of have to have a little patience to get it to apply how you want it, but it all smoothed out nicely after applying my Seche Vite top coat. This particular manicure is part of an experiment to compare 2 different base coats, so you’ll see these nails again later after the results are in. So we’re smack in the middle of summer. 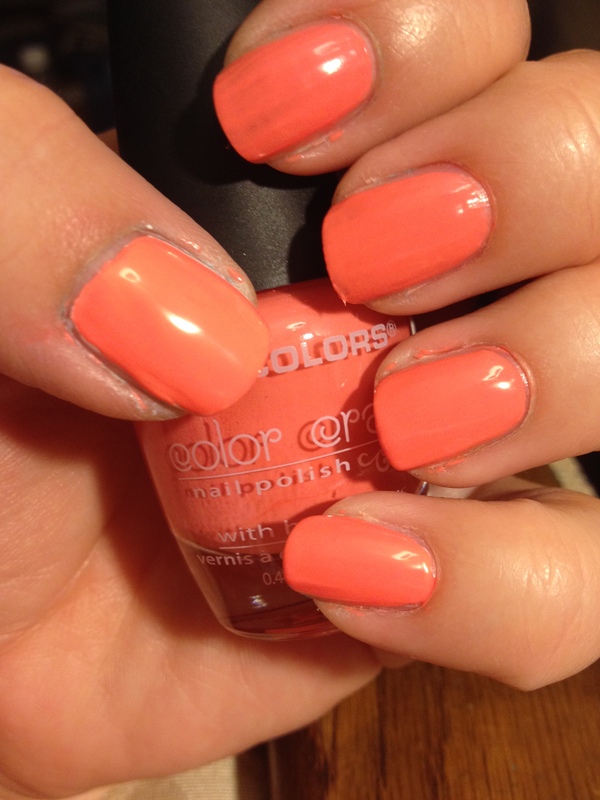 Summer is great for many reasons, not the least of which is wearing neon nail polish! Actually, summer is pretty much the only season in which you can wear neon polish without looking… What’s a nice way to say “trashy”? (You are entitled to disagree with me, but that’s how I feel.) Anyway, since we are in the season of neon, I figured it was a good time to talk about how we can all sport the most eye-searingly neon nails as possible. 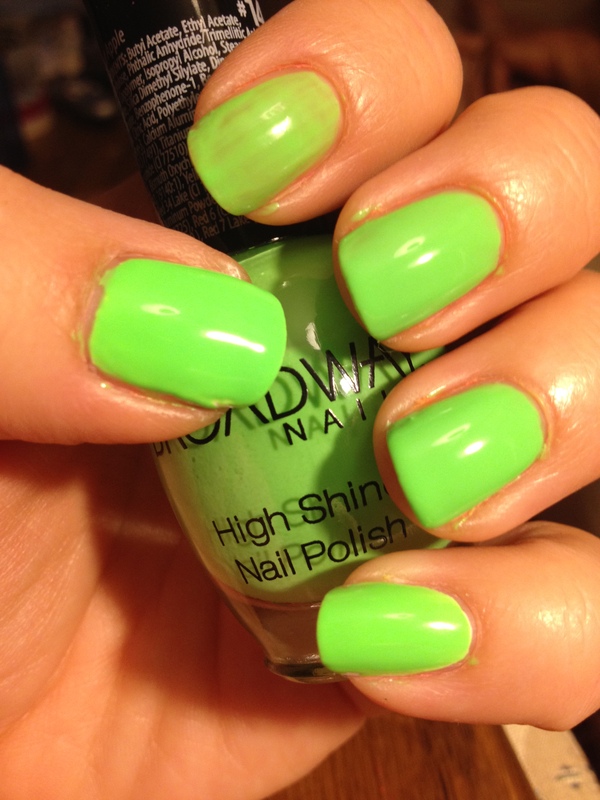 Have you ever purchased a beautifully bright bottle of neon polish that you just couldn’t wait to put on your fingers? You didn’t want much, just for your nails to be as bright as the bottle of polish. Then once you got it on your nails, it was disappointingly drab. It was streaky and see-through, and matte and just didn’t look like anything in the bottle. It was a sad day. Well, I’m here to tell you that you CAN have nails that are just as brilliantly bright as the polish appears in the bottle, and for the most-part, there’s just one really important step that you need to take before you slather on the neon polish…(Drum roll, please. )… You need to paint your nails white first. A lot of neon polish has a pretty shear formula. 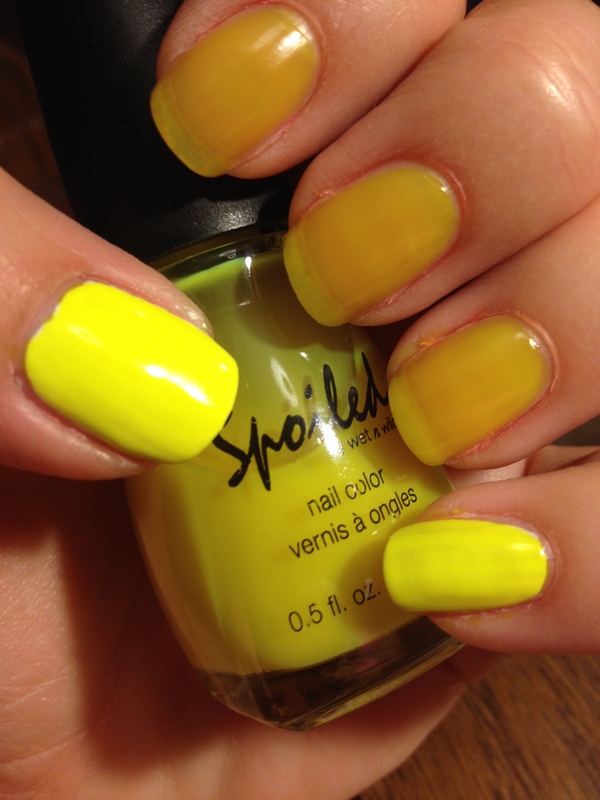 Those “highlighter yellow” polishes almost always have a really transparent jelly formula. Because of that, the only way to get the true color to show up is to make sure it’s on a white background. And you need to take your time and paint your nails really nicely with the white polish. Since the neon polish is tends to be shear, any streaks or missed spots in the white polish are going to show through the neon layer, too. 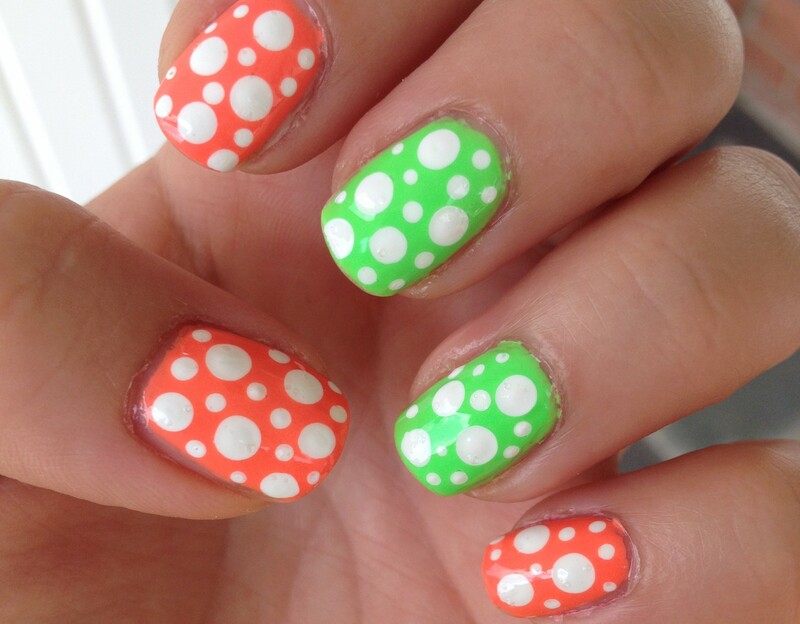 Generally, two good coats of white will make a great base for your neon polish. There are other bloggers out there (many of whom I like a lot) that claim that painting your nails white first should not have to be a requirement, and the nail polish companies need to step up their game and make true neon polish that doesn’t require a white base. I say that those sentiments are all well and good, but the truth is, your neon nails will generally be a heck of a lot brighter if you just take the extra 5 minutes to put down a nice white base. Spoiled – Did I Dye It Too Blonde? I did all of these swatches while watching The Bachelorette. In retrospect, I should have done them during the day so that I could have photographed them in natural light. It’s really hard to capture neon colors on camera as it is, and I think artificial light makes it even worse. I should also point out that I am fully aware that my paint job on some of my fingers is pretty crappy. I was mostly concerned with getting them all done before Andi gave out her final rose. This picture is really deceptive. The color is a crazy bright pink, and with this particular color, it is SO much more vibrant over white. This is a neon bubblegum pink. 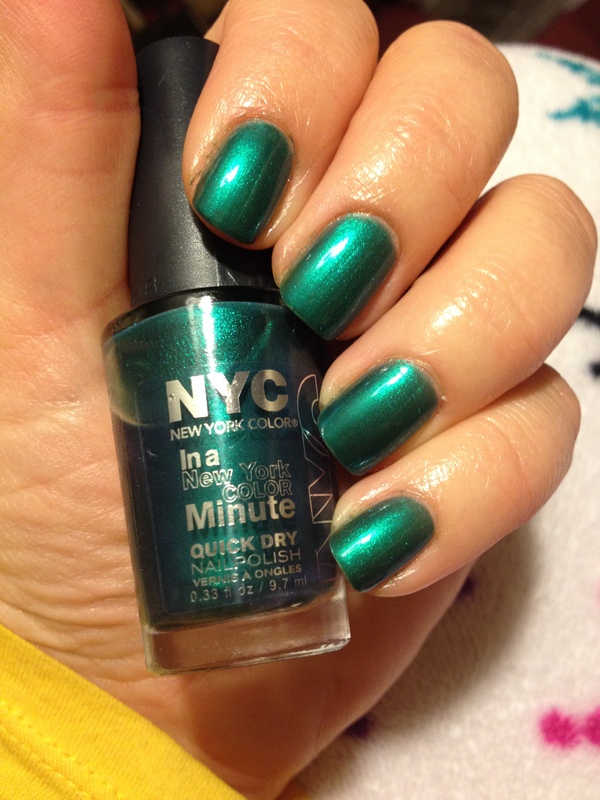 This one is actually just fine without a white base, as long as you do at least 3 coats. A hot pinky-coral. 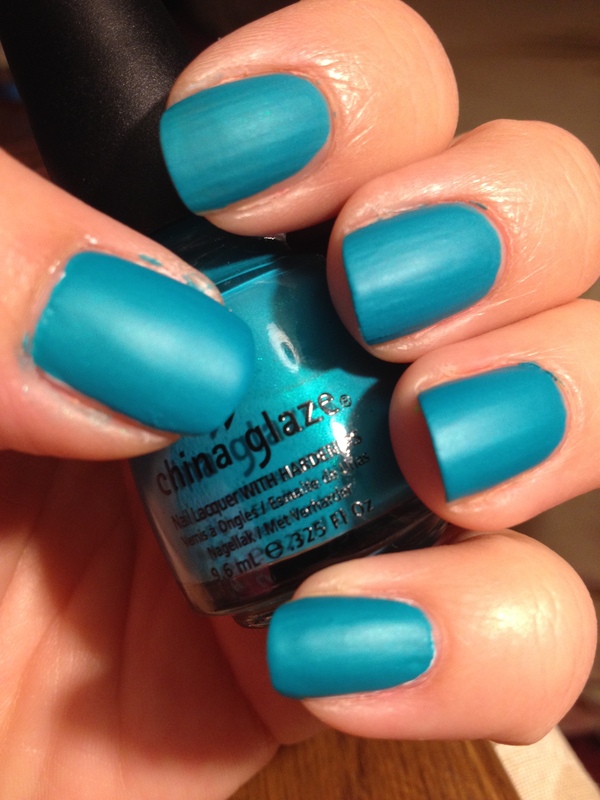 China Glaze makes some really great neon formulas, and this is one of them. Three coats without a white base looks great. This is actually a bright coral. This may not be a true neon, because the formula dries glossy instead of matte. Three coats of this looks good without white underneath. Traffic cone orange. This picture is a little deceptive. Without white underneath, it remains a dingy orange. A white base makes the color blinding! This highlighter yellow is the color that most obviously benefits from a white base underneath. On the pinky, you can see that the streaks from the thin coat of white show through. I love how this looks on the thumb! You definitely need two coats of white under this and then 2 coats of yellow, but the trouble is SO worth it! You can stop traffic with these nails! This color sure looks neon to me, so I was surprised that it dried glossy. An amazing formula for a polish that costs $1! Three coats without white and you are good to go. I LOVE this color! This formula is great, so you don’t need a white base. 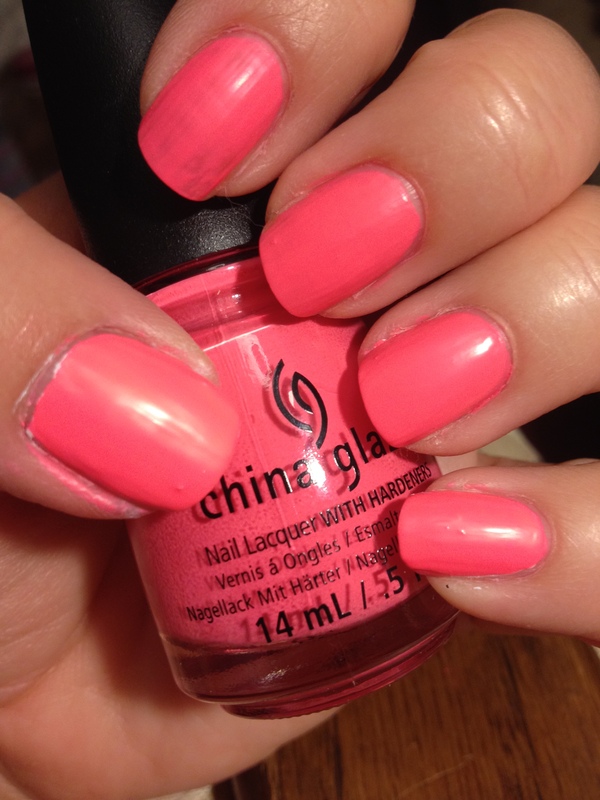 This is not a typical neon color, but it is part of China Glaze’s neon collection. This looks really cool with it’s matte finish, but there is a greenish shimmer in this polish that really shows up when you put a shiny top coat over it. This color, along with the last two, are actually colors that you can get away with wearing year-round. Did I mention that I love this color? Again the color in this picture is really deceptive. I decided to include this color, because like most neons, it dries matte and it really is a bright electric blue in person! It’s sort of irritating, but this color applies much more smoothly when it is not over white, but the color is much brighter when it is over white. I think I’ll have to play with this one a little more to get it just right. 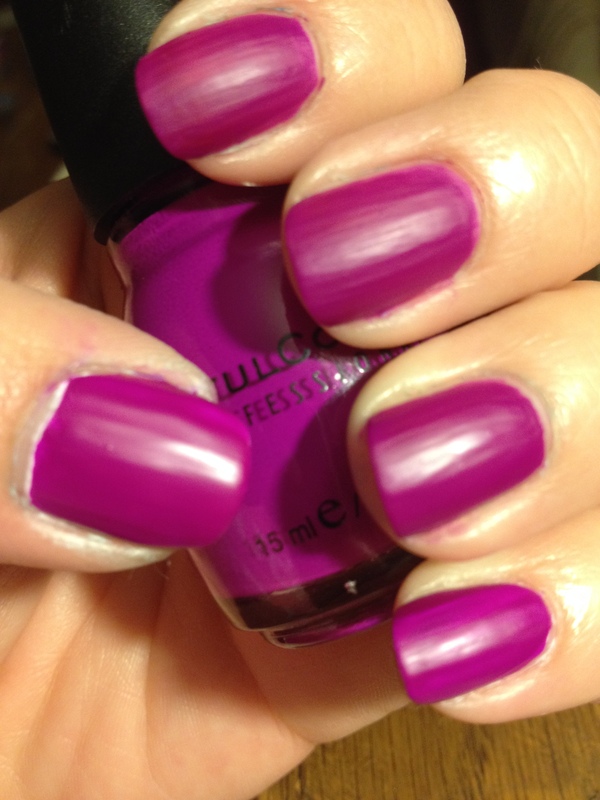 This neon purple looks okay if you do 4 coats on it’s own, but a white coat underneath just makes it pop. You can see some of my husband’s peanut shells underneath. He feels that it is important to shell and eat peanuts while he watches baseball on TV. 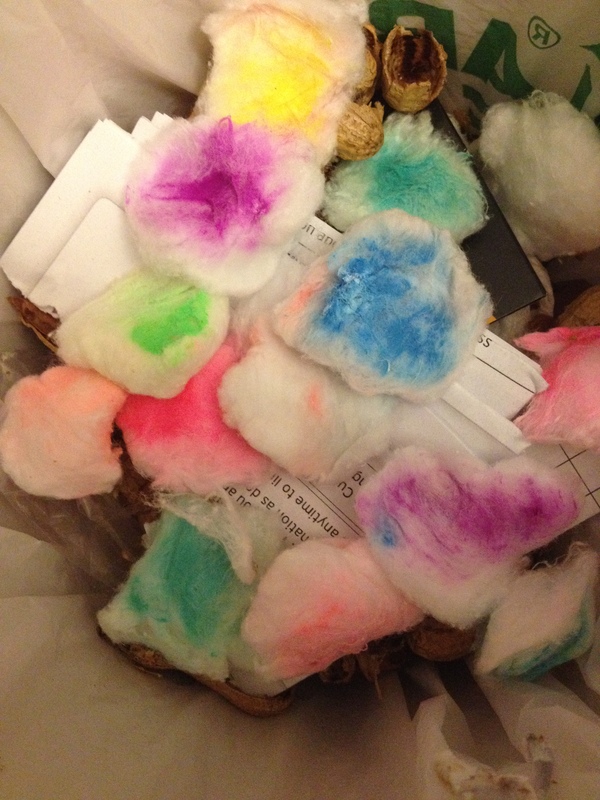 So, as long has he doesn’t complain about the nail polish bottles that are strewn all over our house, I won’t complain about the peanut skins that land on the carpet. The things you do for love. What are your thoughts on applying a white base under neons? 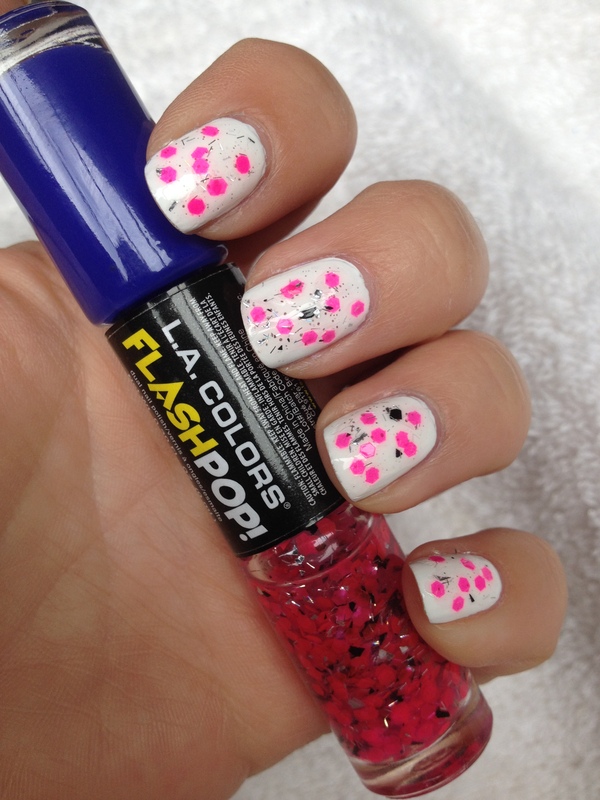 And what are your favorite neon polishes?